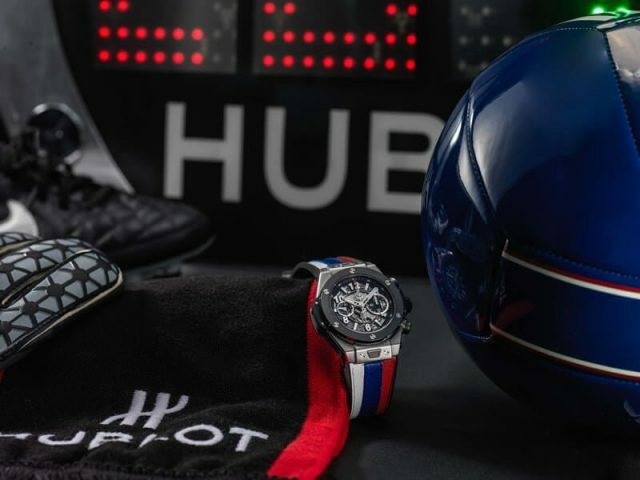 From its new shop in the heart of the Russian capital and under the victorious aura of Pelé the King of football, Hublot marks the time for all the highlights of Planet Football. On 16 June 2017, in the heart of Moscow, Hublot inaugurated its new store in the historic Metropol building. 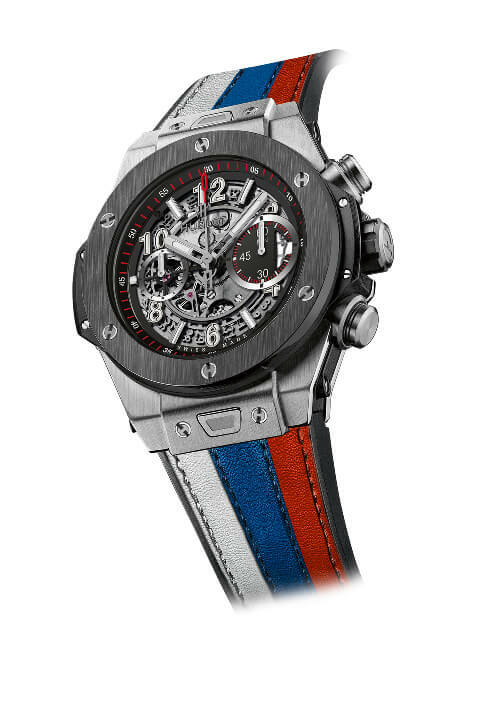 It is no coincidence that Hublot chose this precise moment in time. 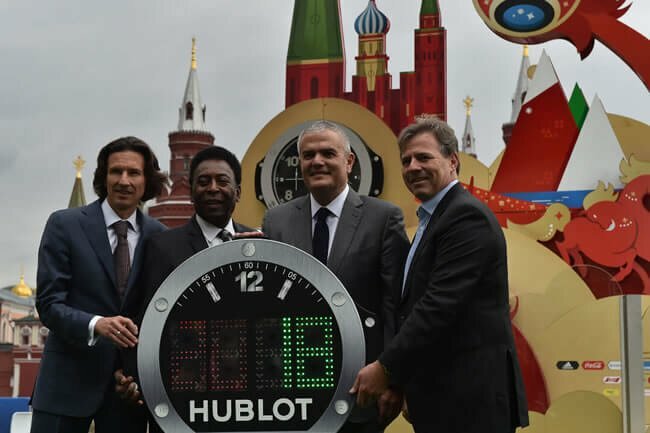 Just 1 year from the FIFA World Cup™, and 1 day from the launch of the FIFA Confederations Cup (from June 17th to July 2nd), on Red Square, the World Cup record-holder Pelé placed his winning touch on time. 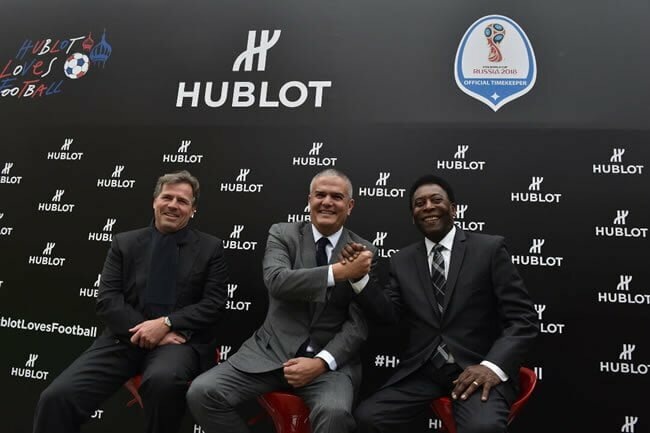 Together with Ricardo Guadalupe, CEO of Hublot and Philippe Le Floc’h, CCO of FIFA, he attended a ribbon-cutting ceremony to the sound of a whistle, signalling once again Hublot’s uncompromising commitment to football. From its status as “Official FIFA Watch” of the 2018 World CupTM, “Official FIFA Timekeeper” of the 2017 Confederations Cup and the 2018 World CupTM, its 4th official boards, including a Big Bang watch with straps bearing the colours of the 8 nations of the Confederations Cup, Hublot reigns supreme in timekeeping and football! 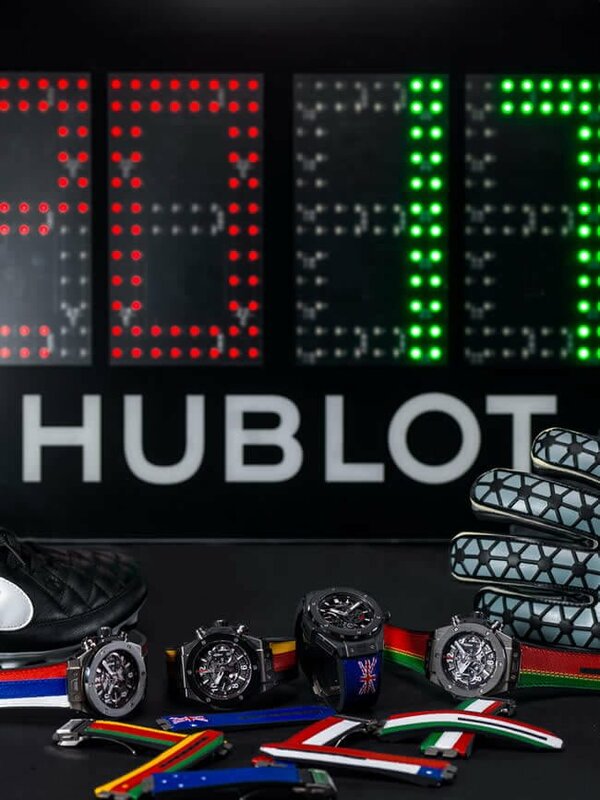 In its new almost 120m2 Metropol shop, Hublot brought its friends together to celebrate the 12 months that separate us from the start of the next FIFA World Cup™. Alongside the Swiss watchmaker was football King Pelé, who at just 17 years of age had 6 goals and 1 World Cup title to his name. He is an unrivalled World Champion, being the only triple winner of the tournament to date. Hublot is the official timekeeper of the FIFA Confederations Cup 2017 and is paying tribute to the 8 footballing nations that will compete on the pitch by presenting a unique series of interchangeable straps in the colours of participating countries on its emblematic Big Bang Unico model. 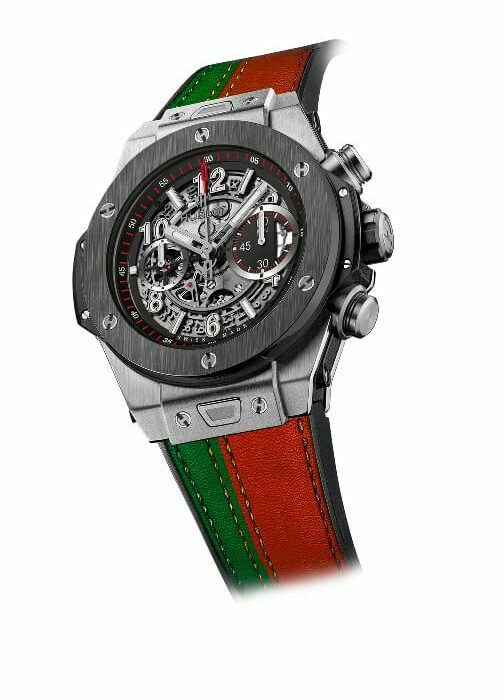 The patented One Click system allows you to support the team of your choice during the matches. The watch has an emblematic manufacturing movement, incorporating 330 components, a flyback chronograph with column wheel on the dial side and two-way automatic winding. 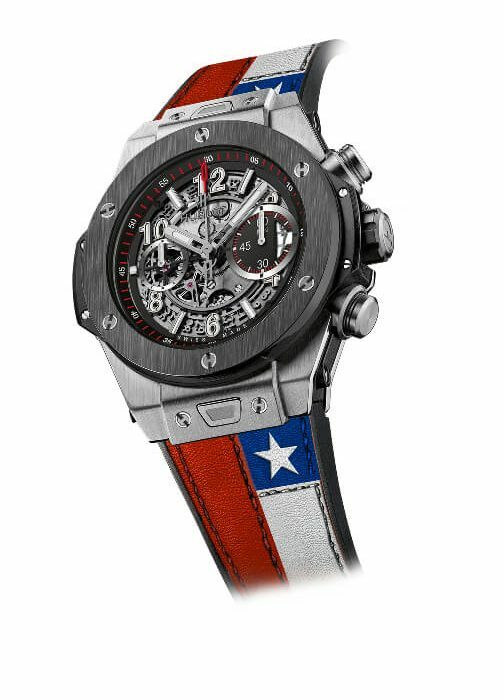 On the pitch, the watchmaker will dominate the game by sequencing the time, player changes and extra time to the rhythm of its official’s boards in the form of the Big Bang model. 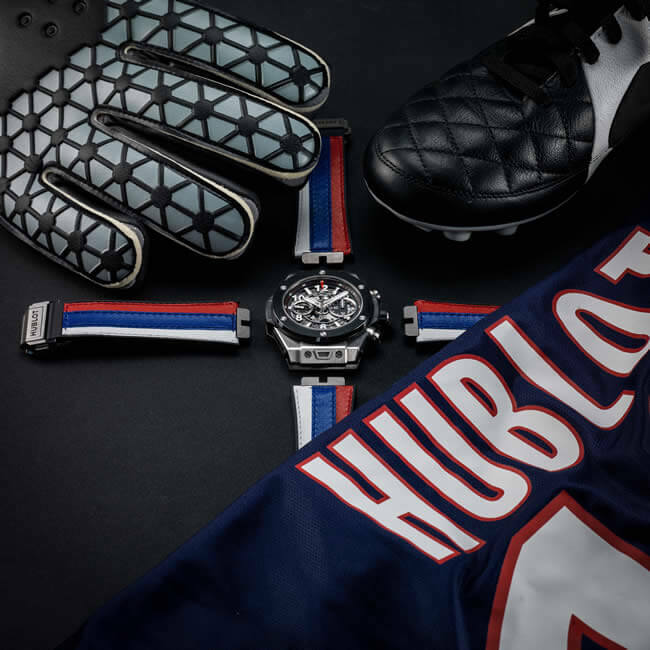 Being a part of the most legendary competitions from FIFA and UEFA, Hublot is a key player in all the matches and all the victories. The Champion of Planet Football will once again be the star watchmaker of the World Cup. Previous articleThe arrival of spring is clearly visible on the new Patrimony small model.